Entering the Oregon Music Hall of Fame -- the folks with the top U.S. single of the year! 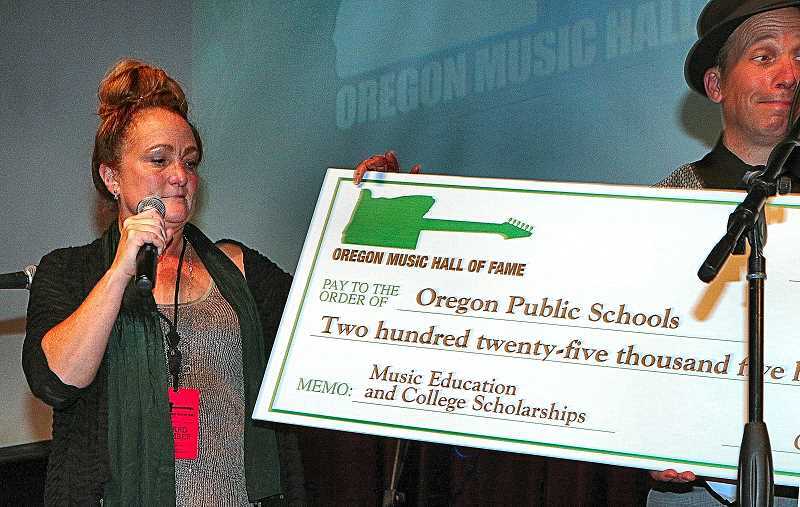 Oregon music legends and supporters of music education returned to the Brooklyn neighborhood on Saturday evening, October 13, for the 12th Annual Oregon Music Hall of Fame (OMHOF) induction and concert show at the Aladdin Theater. "Tonight is a night of great music and celebration, as we again induct musicians, and those working in the industry for more than 20 years, all of whom are originally from Oregon," explained OMHOF's Co-Founder, and Director of Scholarships and Music Education, Janeen Rundle. Again this year, the versatile, hilarious musician-raconteur Tony Starlight began the program with a couple of song parodies before introducing OMHOF's President, Terry Currier of "Music Millennium". Also returning was former KINK and KGON DJ Dave Scott, who live-announced the awardees' awards and played the interstitial music. As the program got underway, Rundle told THE BEE that the evening was much more than simply a grand party. "What else is really important our awards show is supporting music education, which is OMHOF's primary mission. "So far, we've raised $235,000 for music education – including funding $2,500 college scholarships, and presenting 22 Music-in-the-School programs at elementary schools, with gifted rock violinist Aaron Meyer," Rundle said. "We've also sent kids to a music camp with Aaron Meyer; and tonight, three children who have studied with Aaron Meyer – thanks to funding from OMHOF – will be performing." In addition to receiving the 2018 Artist of the Year Award, "Portugal. The Man", that group also picked up the Album of the Year Award for their recording, "Woodstock". All of the members of "Portugal. The Man" currently live in Inner Southeast Portland! Among the awards and the fund-raising "signed guitar auction", attendees were treated to two music acts. First, the "Big Monti" Amundson Trio came back from Nashville, putting on a set that rocked the theater. Later, the octogenarian soul belter Ural Thomas and his band, "The Pain", defined rock and blues music – singing in full voice and showing the younger attendees how to really put on a show that brought the house down. "When I see so many people turn out for this annual program, my heart just bursts with love and pride! It's simply wonderful when you see people step up to support music education," Rundle smiled. Learn more about OHMOF online – www.omhof.org – and plan on being in a seat at the Aladdin Theater on S.E. Milwaukie Avenue next year for the next Oregon Music Hall of Fame awards and concert.